Want to know what is going on in the Chapel Hill area to commemorate Veterans Day? Just scan through the current news items on this site or visit the Chapelboro.com community calendar for current community events. UNC-Chapel Hill ROTC Units Honor Vets – The cadets of the University of North Carolina at Chapel Hill ROTC units invited veterans to the 2014 Veteran’s Day Ceremony at the University of North Carolina at Chapel Hill on Tuesday, November 11, 2014. This ceremony was hosted by the officers and students of the Naval Reserve Officer Training Corps. The ceremony will be located at Carolina Alumni Memorial on Cameron Avenue between Phillips and Memorial Halls on the UNC Campus and will begin at 11:00 AM. This event was open to all veterans in our area and their families. UNC Hospital Chapel Hill Veterans Recognition – The American Legion participates in UNC Hospital’s annual recognition of veteran hospital employees and our local veterans. The event is held in the North Carolina Memorial Hospital building in the atrium. Starting time is 2 p.m. the afternoon, Tuesday, Nov. 11. Dr. Richard Jadick, Commander, U.S. Navy (Ret.) will speak. 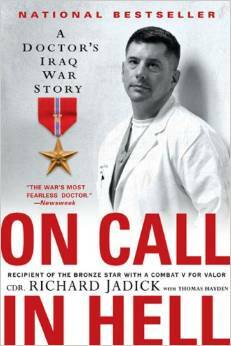 Dr. Jadick was the most-decorated physician in the Iraq War, served in Afghanistan, is the author of the book On Call in Hell and will be flying up from Georgia to speak at our event. Dr. Jadick will be speaking about his experiences in Afghanistan and his thoughts on leadership. Need to speak to a veteran about anything for a news story? Have a question about Veterans Day? Want to help a veteran in need? Give our post commander a call at 919-442-8130. To book a speaker, please request early. It takes time to arrange for a speaker and we receive a lot of requests for speakers during the weeks before and after a military holiday.